Let's Teach English: Passive Voice - Who was this made by? Story and Goal: Five (fictitious) students made projects for school, but one student didn't make a project. Figure out who didn't make a project. Setup: Give each student a worksheet and a card. Each card has a picture of a project from the worksheet, and the name of the fictitious student who made it. The worksheet has the names of the 5 fictitious students, and pictures of all the projects that were made. Read the dialog with the kids once or twice, as well as the the names of the fictitious students. 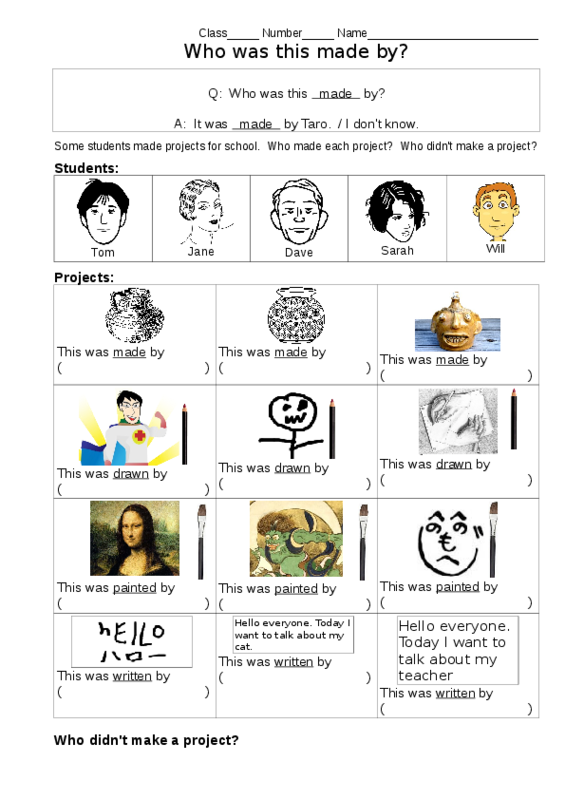 Make sure the real students can read the sentences below all the projects. 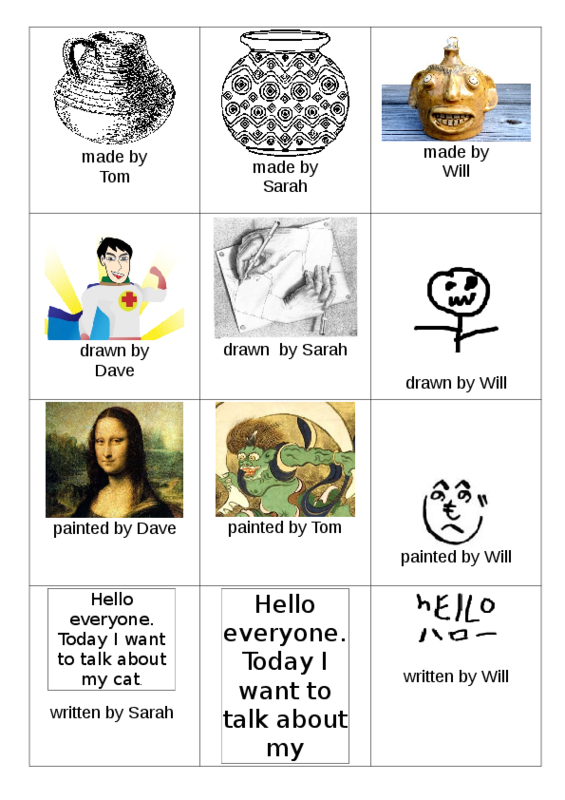 Depending on the project, the students should ask each other "who was this made/painted/drawn/written by" Make sure they know these words, and understand the difference between write, draw, and paint. 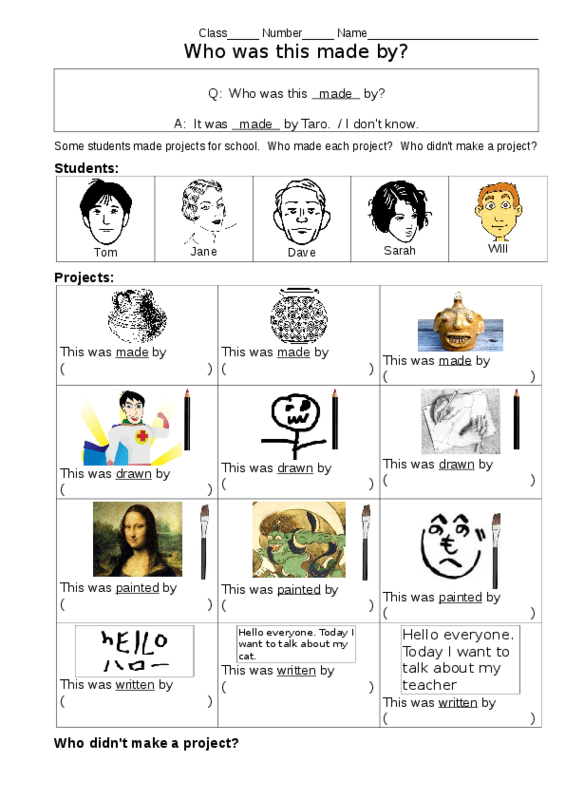 What the kids should do: walk around the class and ask each other "who made this" and point to a project on the worksheet. If the other student has that card, or has learned the answer from another student, he tells the other kid who made it. Otherwise he replies "sorry, I don't know." After asking about several projects, the kids should be able to figure out who didn't make a project. Note: The worksheet and cards are missing images for the faces of the 5 students, and the projects made by Will. I simply hand drew some terrible projects for Will. That way at the end of class you can ask "who made the really bad projects"? You can simplify this by just using the verb "made" and none of the others. Kids have a tendency to cheat, and just look at each other's sheets. Making them point at each other's worksheets is probably the reason for this. Finding a way to avoid may be a wise thing to do.